Have you got the blues? You know – Cobalt, Ultramarine, Cerulean, Phthalo… YInMin – what? That’s right – YInMin. It’s a new blue, well at least a new pigment. And before you get all excited and run out to the art store to buy a tube, you should know that it’s not commercially available yet as a paint. But it will be. And it should be available very soon. 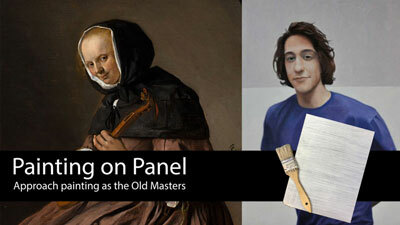 You may be thinking, a new primary color? Yep, that’s right! A new primary is on the horizon and for artists, it could mean a new world of possibilities are just around the corner. 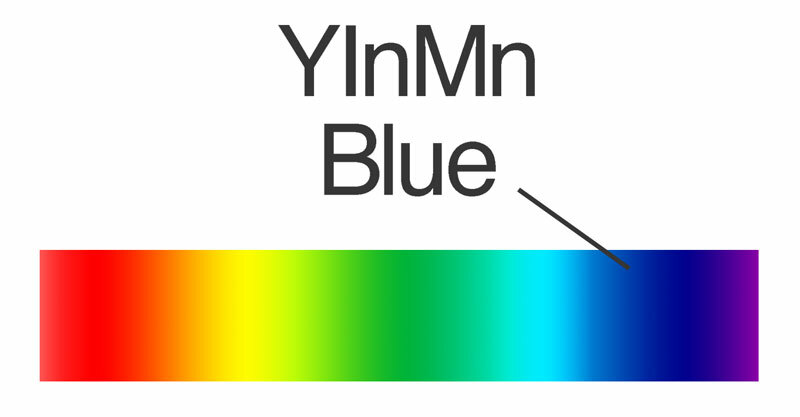 What Is YInMn Blue and Why is its Name So Strange? Just like many other discoveries, YInMn Blue was an accident. It was discovered back in 2009 when a student working under the tutelage of chemist Dr. Mas Subramanian at Oregon State University, combined Yttrium, Indium, and Manganese Oxide in a furnace. The result was a brilliant blue that is similar to Ultramarine, but brighter. The researchers weren’t looking for a new color, they just happened to find one. The name is a combination of the ingredients and my guess is that this name will not be the name that gets used forever. Some have already started calling it the easier to read, “Yin Min” and one company, Derivan, is calling the color “Oregon Blue” in honor of the location in which it was discovered. Crayola has even gotten in on the color naming game by running a contest to a name a new blue crayon inspired by the discovery. If you’ve ever wanted to name a color, here’s your chance. You can cast your vote here. 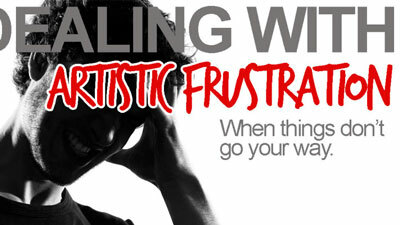 Why Is This Blue Significant to Artists? The significance of this new blue is yet to be seen, but there are many promising signs that this new blue could be a big “game changer” – and not just for artists as we’ll discuss in a moment. 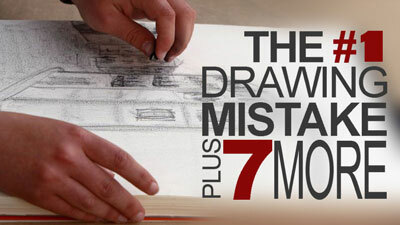 But first, let’s consider its significance to artists. To put this discovery in perspective, we must consider that the last time a new blue was discovered was in 1802 when Louis Jacques Thénard discovered Cobalt Blue. This isn’t just a new color either – it’s a primary. This means that it opens the possibilities for a new spectrum of colors that can be mixed. 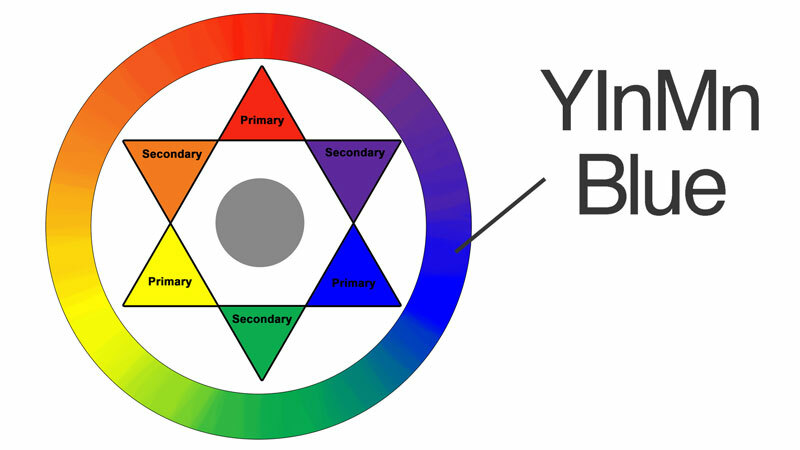 The primary colors that we use to mix a secondary color greatly influence the color that results. When it comes to color theory, we know that when we mix blue and red, we get a purple. But when it comes to the science of color mixing, the purple hue that we actually create depends on the primary pigments that we use. So in reality, there is a great number of “purples” that we can create based on the primary pigments that we use to mix them. So with a new blue in the mix, so to speak, we potentially get a brand new set of colors that can be mixed from it. That’s a whole lot of new purples and greens. Where Does This New Blue “Fit” with the Other Blues? 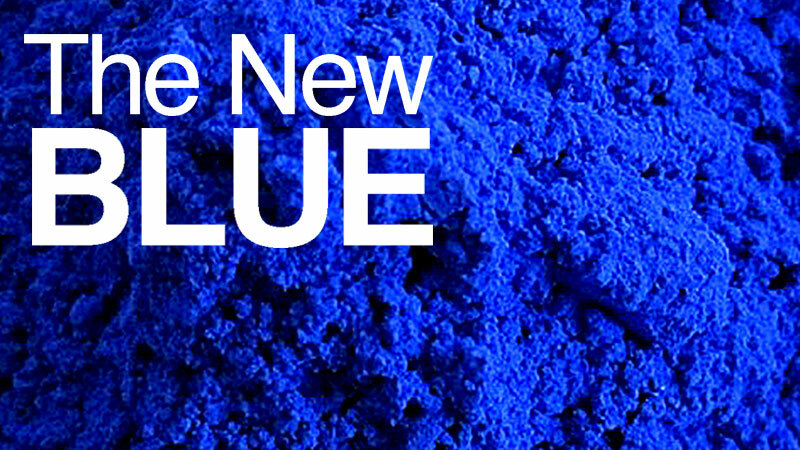 YInMn blue is most similar to Ultramarine, but brighter. It’s also close to Cobalt Blue, which some artists prefer to use as their “primary blue”. All primary colors “lean” warm or cool. This is dependent on their location on the color wheel, although there is some debate when it comes to blue pigments specifically. Blue is considered a cool color and there’s no doubt about this. It is the coolest of the colors. Some argue that blues closer to red on the color wheel are warmer. This means that the blues that lean towards purple are considered the “warm blues”. Those under this school of thought consider Ultramarine as a warm blue. Since YInMn is close to Ultramarine, then we must also consider it to be a warm blue. Some folks believe that since the color wheel is simply the color spectrum bent into a circle, we should consider the color spectrum instead. 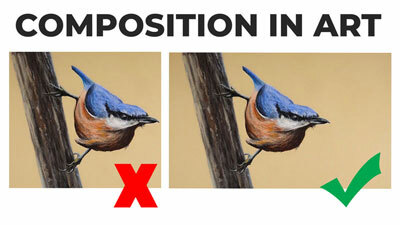 If we do this, then Ultramarine is far away from red. If we look at things this way, then Ultramarine is clearly a cool blue, and therefore the new blue must also be a cool blue. For other primaries, there isn’t a debate. 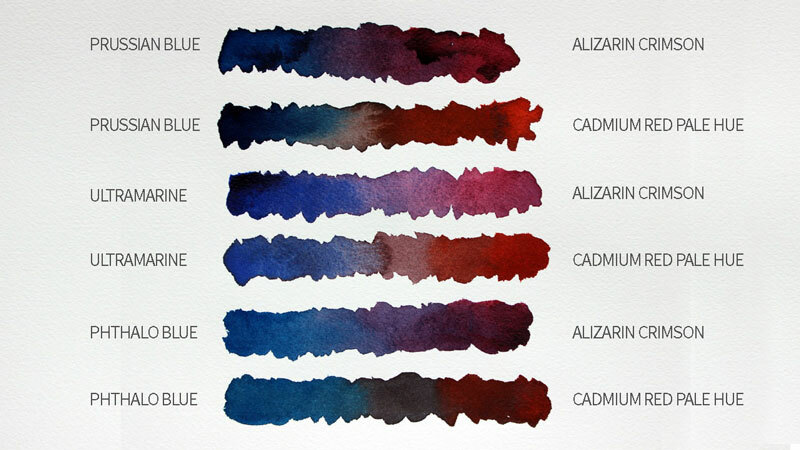 We can clearly see that Alizarin Crimson is cooler while Cadmium Red is warmer. It’s just blue that gives us fits and causes such discussion (sometimes heated). I think that we as humans just have a hard time understanding the color blue and its different versions. And when it comes to practical applications, arguing whether a particular blue is warmer or cooler is really not a good use of time. We could better spend that time experimenting with mixes and keeping a record of the results in a color chart, for example. YInMn Blue is proving that it may be a superior blue. For starters, the color is showing promising signs of being fade-proof. In comparison, Ultramarine is notorious for fading over time. In addition to being fade-proof, the color is also very vibrant. In fact, it reflects only blue waves of light, absorbing all traces of red and green. This could mean that this new blue may be the purest blue in existence. The color is also non-toxic which is in stark contrast to Cobalt Blue, which is toxic if inhaled or ingested. Another interesting benefit is the color’s heat resistance. This could mean that the color could be used on products that need to stay cool or on roof and car tops. Although the color is not quite available as a paint, you may already be considering how you’re going to use it. Could it become your new primary blue for mixing? Possibly, but some experimentation is in order and we won’t be able to do that until the color is available in paint tubes. What do you think? Are you excited about this new color? What are your plans for it? I’d love to hear what you think in the comments section below. Having this new blue YlnMn very exciting with a lot of potential for colour mixing. Any idea when this might be coming on the market? I’m not sure when it will be available but it should be quite soon. At least one company has begun the process of developing the color for commercial sale in paint tubes. I think it is a great idea to add this blue. I like the way it looks.